A Solar PV-Diesel Hybrid System combines the power output of PV arrays and the diesel generators. The control system draws power in such a way that it maximizes the load on PV and minimizes on Diesel Generators. If there are multiple generators and there is sufficient power from PV, it shuts off some of the generators completely to minimize fuel consumption. The fuel save controller houses an intelligent energy management system. Fuel Save Controller (FSC) is a key component of the proposed SPV plant. 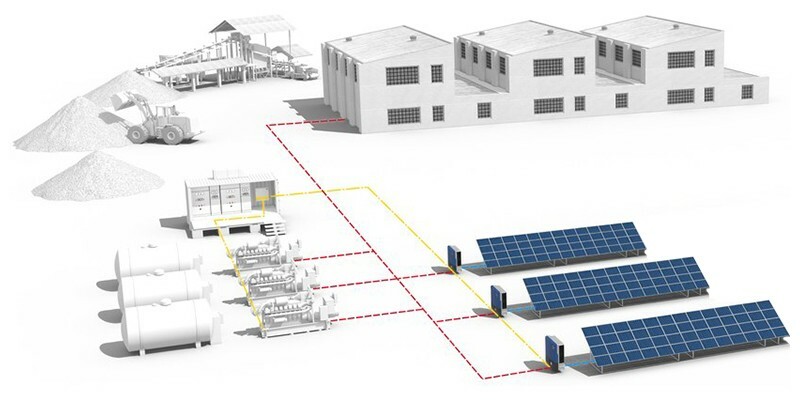 As the link between the DG sets, the PV system and the plant load, FSC will take on all the demand-based control of PV Feed in, depending on the load and generation profiles. FSC meets comprehensive grid management functions within the integrated system. Notably, hybrid systems can be expanded on a modular basis at any time and provide reliable system control through remote monitoring. The solar-hybrid system is smart solution and uses potential of solar system effectively. A 100 kW Hybrid System helps to reduce emission by approx 150 tones/ year.